Mini Motorcross the dirt track action of small motocross bikes. The mini dirt bike fascination. Mini Motorcross : Training for the Future. Mini motorcross racing offers the challenge of racing to all ages. The concept started in the 1950s when drag racers used them to maneuver around narrow pit roads. The small bikes took up little room and were much faster than other ways to get around. Kids jumped on the idea, putting one together in the garage or back yard. It did not take long for companies to get on the bandwagon and produce lightweight, sleek mini motorcross bikes or pit bikes. Kids ages 8 through 10 generally have a 50cc bike. There is more diversity for preteens and teens, with 80cc, 88cc, 100cc and 125cc bikes offered. Power and speed blend with minimal weight and maximum control in the 125cc category, making that bike a favorite choice by riders. Ecology laws affect everything, even the pocketbike Mini moto. The pocketbike is less than 20 inches high and a bit over 3 feet long and is available in electric and gasoline versions. The engine provides the power needed for this size bike; the 39cc to 50cc two-stroke engine shells out up to 6 horsepower, with maximum speed of 18 to 40 MPH. Chinese imports are inexpensive and include brands such as V-Racer and Sendai. More restrictive pollution regulations are opening the path to four-stroke engines. Pocketbikes provide the feel and excitement of motorcycle competition, mini moto style. Racing the bikes on motocross and Supercross tracks is extremely popular for the up and coming racers and the fans. 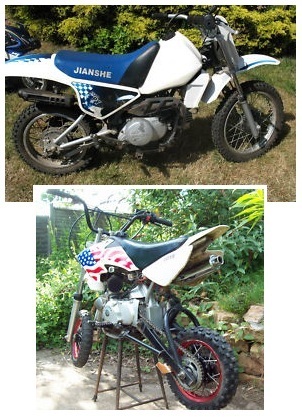 Many motocross girls have a mini dirtbike, among their motorcycles too. Dirt mini bikes and their riders. The US has quite a few series and mini moto pros, such as the biggest mini moto event of the year, the Las Vegas Mini Supercross. To see a video of the 2009 World Mini Grand Prix, see further down this page. The 23rd annual Maxima CMCC (California Mini Motorcycle Club) Mini Nationals is coming up July 9 and 10, 2011 at Barona Oaks MX Park. The 408MX club out of San Jose CA holds competition, lessons and practice at the San Jose County Fairgrounds, home of the famous San Jose Mile dirt track. A beginners track has some small jumps and allows anyone new to mini motorcross to learn to turn in the dirt and gain confidence before moving to the other tracks. Ricky Carmichael and James Stewart are among the list of superlative motocross riders who started competition at a young age. Another name on the chart is Justin Barcia, born March 25, 1992, winner of the 2010 "King of Bercy" Paris Supercross and 2011 AMA 250 Lites East Regional Supercross Champion. Barcia joined the competition at age 5 and continued to build his skills and eliminate challenges by practicing in outdoor areas around his New York home. A move to Georgia gave him the opportunity to race indoors and out during the year. The motocross world watched his climb up the amateur ladder as he took 10 amateur titles from 2005 to 2007. Barcia has been racing the pro circuit for a year and a half with GEICO Honda team, managed by veteran racer Matt LaRocco. Individual wins in High Point and Moto-X 338 are a result of his dedication, motivation, training and certainly a reflection of his mini motorcross experience. 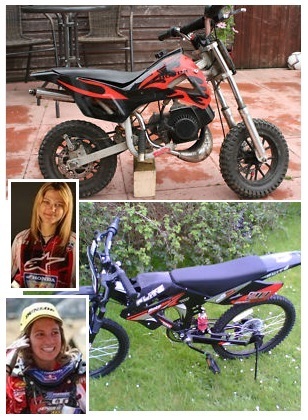 Final word - Motocross girls are also finding the mini dirt bike fantastic fun, as they are accessible and less daunting. Perhaps one day we’ll see Ashley Fiolek on a mini motocross ride, having some laffs on these trippin’ motorbikes. Look below to see a video of a "talked about" performance at the 2011 AMA Supercross and catch a glimpse of James Stewart's younger brother Malcolm at the same time.